A tiny bioengineered tooth bud has been successfully created and implanted in an adult mouse by Tokyo University researchers. They took epithelial cells and mesenchymal cells (about 50,000 each) from a mouse embryo and cultivated them together in a collagen-based medium to create a tiny tooth bud. 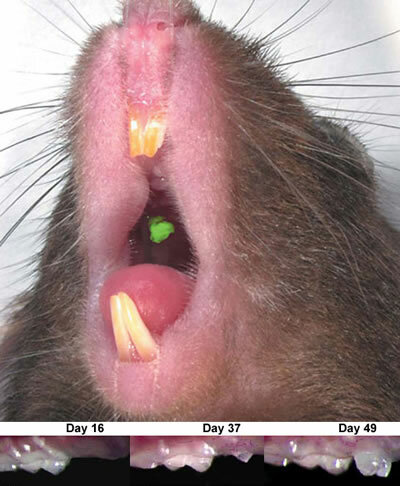 Here, we report a successful fully functioning tooth replacement in an adult mouse achieved through the transplantation of bioengineered tooth germ into the alveolar bone in the lost tooth region. We propose this technology as a model for future organ replacement therapies. The bioengineered tooth, which was erupted and occluded, had the correct tooth structure, hardness of mineralized tissues for mastication, and response to noxious stimulations such as mechanical stress and pain in cooperation with other oral and maxillofacial tissues. When Angelo smiled, revealing the razor-sharp canines of some large animal, Case was actually relieved. Toothbud transplants. He'd seen that before. From Fully functional bioengineered tooth replacement as an organ replacement therapy via Pink Tentacle.